Remember back during the Republican primaries when Newtmentum was predicated on the fantasy of the eventual GOP candidate embarrassing the President on the national debate stage? I thought it was a pretty dumb thing to center a candidacy around. After all, even if you were to suppose that such a thorough debate victory were possible, there have honestly been two debates since World War II that have had a meaningful impact (1960 and 1980). It’d be like acquiring a baseball player because he had a propensity to hit for the cycle – an interesting, sort of productive oddity that wouldn’t make much of a dent in the grand scheme of things. I was hardly alone in this. It would seem I was wrong. Maybe if Romney can turn this whole campaign around in 90 minutes, Obama can now do the same. But I doubt it. 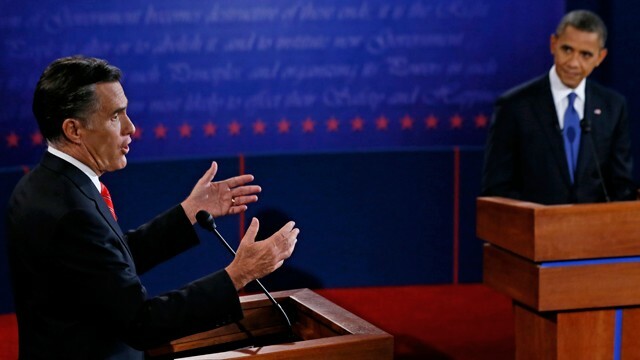 A sitting president does not recover from being obliterated on substance, style and likability in the first debate and get much of a chance to come back. He has, at a critical moment, deeply depressed his base and his supporters and independents are flocking to Romney in droves. Gallup also notes that roughly 2 in 3 Americans watched the debate (! ), and the margins by which they declared Romney the winner have Gallup calling the debate “historic.” A Politico/GWU poll shows a statistical tie with momentum building among the Republican base as it fades with their Democratic counterparts. It’s still early October, obviously. But it looks as if Mitt Romney took a campaign tactic that has not been a viable weapon for at least 32 years and used it to dramatically alter the Presidential election. I won’t dispute that those are bad numbers for Obama. But are you suggesting that Romney might still win? I still don’t believe it. The national polls don’t matter; only the state ones do. Romney is still down in Ohio and Virginia. If he loses both those states, he loses the election. He can even win both of them and still lose. Even his camp acknowledges that the electoral map looks dismal for them. The point is that Obama’s path to 270 is much, much wider than Romney’s, and a week from now, the first debate will be old news. The media were just dying for the “Romney comeback” story, and they found it in that, and everyone is playing into the hype. Remember when the “47 percent” remarks were first unveiled? Yeah, everyone said at the time that Romney had just lost the election — and in my opinion, that was a much bigger disaster for Romney than the lackluster debate performance is for Obama. The tone of campaigns is driven by whatever the latest news story is, but the latest news story by itself hardly determines the outcome. I don’t think Romney will win and never have – I agree with you that he has almost no margin for error with electoral votes. Mostly, I was astounded that a debate – a debate! – could produce that kind of poll movement. Which is a positive thing overall, I suppose. I don’t agree at all that this was the result of the media having an itchy trigger finger – if anything, they had already started the postmortem process (remember the piece about “infighting” in the Romney camp?). If you want to point to evidence of horse race coverage, it’s when these post-debate polls are presented in a vacuum without any connection to the battleground states. And come on – I can’t believe anyone would seriously suggest that the “47%” comment is more significant than a President completely face planting in prime time in front of a record TV audience. You can’t have it both ways – either Romney is going to lose because he’s got an extremely tough electoral road to hoe and he’s not an exceptional enough candidate to do it, or he’s going to lose because of some comment at a fundraiser. It is quite obviously the former, as you described in the first half of your comment. The main reason I mentioned the “47 percent” remarks is to illustrate the knee-jerk reaction that typically results when a major political story breaks (i.e., “___ just lost the election!” or “this is a complete game-changer!”). Polls usually follow suit. The media hyped up the first debate to be a huge deal — even though it really wasn’t at all, since incumbents usually lose the first debate — so it’s not surprising that Romney got a significant bump, at least in national polling. Any self-respecting political analyst should recognize that. But it’s important to sell headlines, and the Great Romney Comeback of 2012 makes for a fascinating story, especially when, as you noted, he had already been declared a lost cause. I don’t think Obama did anything devastating to himself in the first debate. His performance was simply flaccid and uninspiring, and, if anything, few expected Romney to be so strong, which is why he was so quickly declared the winner. (Again, I’m not disputing that he won.) But if the most memorable sound bite of the evening was Romney’s Big Bird comment, then you have to admit that his secretly-recorded remarks at the private fundraiser easily eclipse anything that was said in Denver last week. Ehhhh….I’m not buying that this was some kind of invention of the media. Flash polls immediately afterward had people saying – by 40 or 50 percentage points – that Romney won, before any reaction from the punditry could establish a narrative.